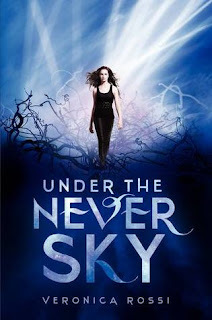 Today, I'm featuring UNDER THE NEVER SKY, a YA dystopia featuring sheltered teen Aria who is dropped off in the barren outside to die, but meets a toughened up boy, Perry, who helps her survive. UNDER THE NEVER SKY is such an immersive experience. From the moment I met Aria, breaking the rules of her enclosed city of Reverie in order to glean intel about her missing mother, I knew she was the kind of character to follow to the ends of the Earth. And then I met Perry, the other POV in this dual narrative. Perry's had a hard life on the outside (known as the Death Shop because there are a million ways to die in its inhospitable lands), and perhaps because of this, he's much more manly than most YA guys. In fact, his mix of stubbornness and gallantry reminded me a lot of a Harlequin Historical alpha male (in a good way). I loved the intricate world building, the fast-paced mystery driven plot, and the realness of the situations despite the fantastical setting (Aria even gets her period - how often do you see that in YA sci-fi?). Yes, readers, this is one for my keeper shelf. And now, let's hear from Veronica! This is so hard to pick! I do love the scene where Perry and Aria are up on the roof at Marron's together. It's a quiet scene, but there's so much going on beneath the surface. I think that scene is really the emotional heart of the book. Oh man - roof scenes get me every time, and this one was killer. So, what is your favorite line in the book? It's so Perry--completely to the point. SWOON! Seriously! What setting was most fun to write? I loved writing Delphi--Marron's place. It felt like a hybrid between a house and a museum--something I'd love to live in myself! I loved Delphi too. It's definitely up there on my list of literary places I'd love to explore. Who is your favorite supporting character - one you could see getting a spin-off book - and why? This one is easy! Roar, because he's unpredictable and funny, and he wears his heart on his sleeve. There's a lot more to Roar than meets the eye. It would be a blast to be able to focus on his character. There have been so many! I have loved becoming part of the writing community. I've met some incredible writers, bloggers, readers. It's truly a fantastic community. And I've so enjoyed hearing from readers who connected with the story! It's simply amazing when that happens. Intrigued by UNDER THE NEVER SKY? It came out Tuesday in hardcover. Find out more about it at the author's website and add it to Goodreads. 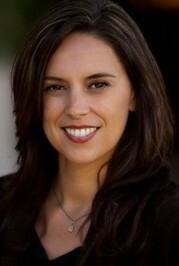 Also, read my Dystopian August preview interview with Veronica for more teasers. In the interest of full disclosure, you should know that I met Veronica last month for dinner and drinks and hope we can do it again soon! 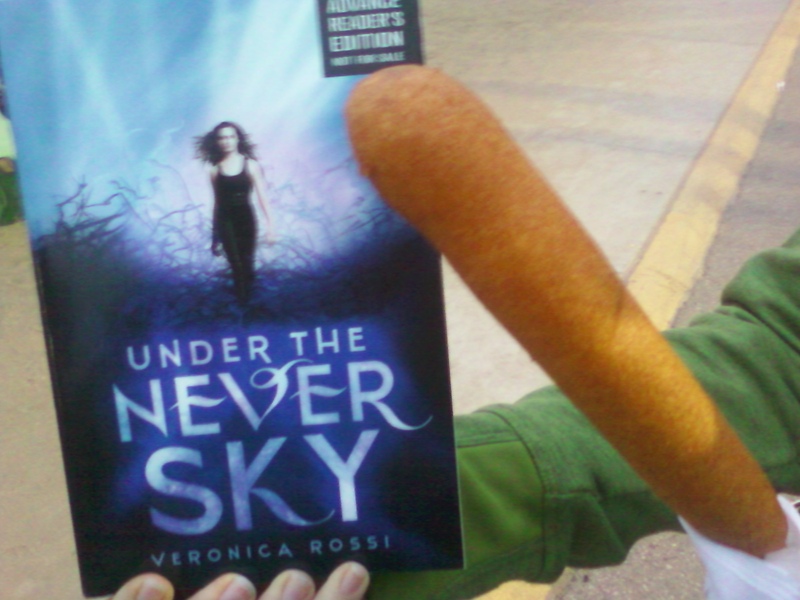 Also, bonus photo of me with UNDER THE NEVER SKY at the Kansas State Fair - eating a giant corn dog! I love the opportunity to hear an author talk about her own work! Under the Never Sky really does sound like an "immersive" read. And I want to know more about Roar! What an awesome name for a character. If this one is going on your keeper shelf then that screams to me to read it! Thanks so much for having me, Lenore! You = awesome. Like a lot of the books you have been featuring lately, this one sounds like something that would make for a very entertaining read. I like that it's so realistic, and that the male protagonist is so strong and such a protector. I am adding this one to my list, and perhaps seeing if the library has it as soon as I leave this comment. Thanks for the great review on this one Lenore. The interview was fantastic too! I'm so happy to hear you loved this one! 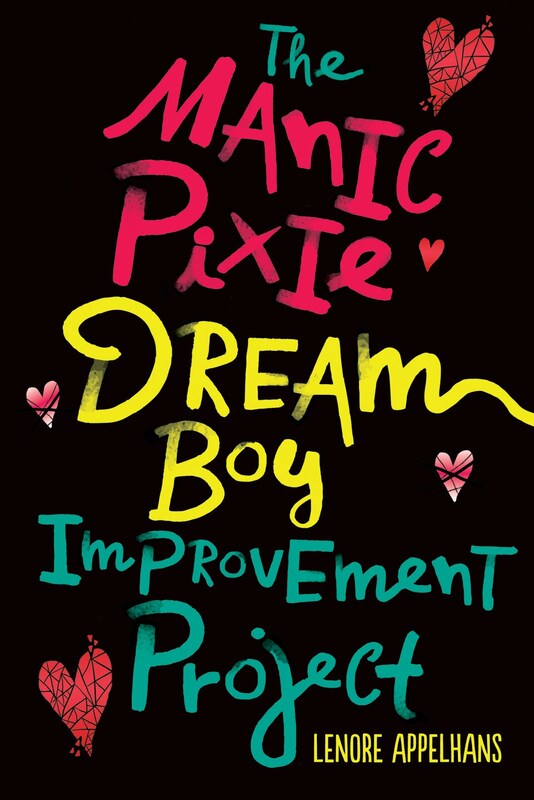 I just ordered it and I can't wait to read it too. I'm currently reading this, and am liking it a lot! Veronica and Lenore rock. I love the effects on the cover! Just ordered a copy of Under the Sky! I hadn't heard much about it, so I am glad to have come across your review! btw...that is one giant corn dog! I was constantly mesmerized while reading this book. Especially, when it came down to trying to figure out how these two saw each other. Reading from their point of views as they embarked on a dangerous journey into the unknown, put me down in the trenches with them. I love these types of novels and UNDER THE NEVER SKY is one you don¿t want to miss!